SpaceX successfully conducted a second attempt to launch its Falcon 9 rocket, tasked with sending the CRS-5/SpX-5 Dragon spacecraft to the International Space Station. Launch took place on Saturday at 4:47 am local, which included an attempt to land the first stage of the rocket on a floating platform – which was not a complete success. The seventh flight of SpaceX’s Dragon spacecraft, the mission is CRS-5, the fifth of twelve under the initial Commercial Resupply Services contract which SpaceX was awarded in 2008. Riding atop SpaceX’s Falcon 9 rocket, the Dragon will deliver 2,317 kilograms (5,108 lb) of cargo to the International Space Station. After spending around a month berthed at the station, Dragon will return to Earth under parachute for recovery in the Pacific Ocean. The cargo aboard the Dragon includes 490 kilograms (1080 lb) of personal care equipment and provisions for the space station’s crew, 717 kilograms (1,581 lb) of space station hardware totalling 678 kg (1,495 lb) for the US and Japanese parts of the station and 39 kg (86 lb) for the Russian segment, 16 kilograms (35 lb) of computer equipment and 23 kilograms (51 lb) of hardware for EVAs. A total of 577 kilograms (1,272 lb) of scientific hardware is being carried within the Dragon capsule, while the 494-kilogram (1,089 lb) Cloud-Aerosol Transport System (CATS) experiment is flying in the unpressurised Trunk section of the spacecraft. This will be attached to the Japanese Experiment Module, Kibo, and will be used to study particulates in the Earth’s atmosphere. CATS uses a Lidar instrument, consisting of a laser which is directed at the Earth’s surface allowing backscattered light to be analysed. The primary objectives of the mission are to measure the altitude distribution of aerosols in the Earth’s atmosphere and to collect data to help improve climate models. It follows on from the CALIPSO satellite, launched in April 2006, which forms part of the A-train constellation. Other scientific payloads being carried aboard the Dragon include a host of bioscience experiments. One will study cell regeneration in flatworms in microgravity, while another – the Fruit Fly Lab, or ISS Drosophila Experiment – will analyse changes in fruit flies’ immune systems in the space environment. The Micro 5 experiment will study the immune response of roundworm species Caenorhabditis elegans when exposed to salmonella typhimurium during long-duration flight, while the NanoRacks Self-Assembly in Biology and the Origin of Life (SABOL) will study the growth of amyloid fibrils in microgravity. 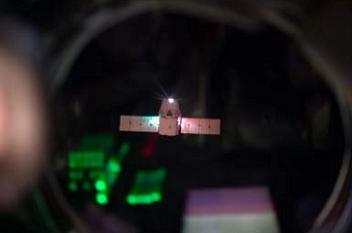 Several small satellites will also be carried aboard the Dragon for deployment from the ISS. These include a pair of Flock-1d’ satellites rapidly assembled to replace some of the spacecraft lost in a launch failure of Orbital Sciences’ Antares rocket last October. Flock-1 satellites are three-unit CubeSats operated by Planet Labs for commercial Earth imaging from low orbits. The satellites have short operational lifespans and typically decay from orbit around six months after launch. Brazil’s AESP-14 single-unit CubeSat is also aboard the Dragon. The satellite, developed by Brazil’s Instituto Tecnológico de Aeronáutica in collaboration with the Instituto Nacional de Pesquisas Espaciais (INPE), will be used to study plasma bubbles in the ionosphere. The SERPENS satellite, a three-unit spacecraft operated by a group of Brazilian universities, is also believed to be aboard the mission. 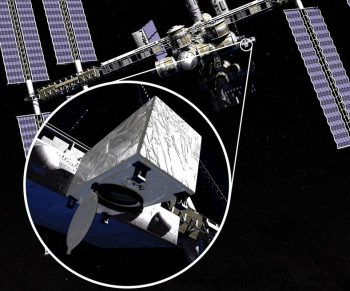 This spacecraft will be used for technology development, testing communications systems in orbit. 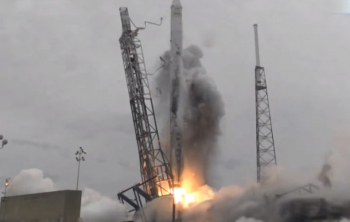 CRS-5 was launched by SpaceX using their Falcon 9 rocket, which made its fourteenth flight. It was the ninth time the vehicle has flown in the v1.1 configuration, which is now used for all launches. In its previous missions the rocket has performed successfully twelve times, with one early flight in the v1.0 configuration suffering a partial failure after losing a first stage engine during ascent. The rocket was able to deliver one of its two payloads – a Dragon spacecraft – to the correct orbit, however the second, an Orbcomm communications satellite, was lost. The Falcon 9 is currently the only rocket operated by SpaceX – its smaller Falcon 1 was retired following five launches in favour of flying smaller satellites as secondary payloads on the Falcon 9, while the larger Falcon Heavy remains under development. SpaceX, which was founded in 2002 by Elon Musk, conducted its first launch in March 2006 when a Falcon 1 failed to reach orbit with the US Air Force Academy’s FalconSat-2 spacecraft. The Falcon 1’s first success came at the fourth attempt in September 2008, with a further successful launch in 2009 orbiting a Malaysian earth imaging satellite, RazakSat. The Falcon 9 first flew in June 2010, carrying the Dragon Spacecraft Qualification Unit, a payload simulator intended to verify the performance of the rocket with a Dragon spacecraft aboard. The next mission in December of the same year orbited the first functional Dragon, with the first mission to the International Space Station taking place in May 2012. 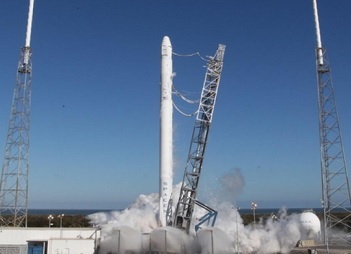 After the first five launches – which all carried Dragons – the enhanced Falcon 9 v1.1 was introduced in September 2013. Featuring stretched first and second stages, uprated engines and a rearranged engine layout on the first stage, this configuration has been used for all launches since. Liftoff took place from Space Launch Complex 40 at the Cape Canaveral Air Force Station, a former Titan launch pad which was converted for SpaceX’s use in 2008. The complex had previously been used by Titan IIIC, 34D, Commercial Titan III and Titan IV vehicles, from the maiden flight of the Titan IIIC in 1965 to the penultimate Titan IV launch in 2005. SpaceX first used the pad for the Falcon 9’s maiden flight, with all but one of the rocket’s missions to date using the pad. SpaceX’s other Falcon 9 pad, Space Launch Complex 4 at Vandenberg Air Force Base, is also a former Titan IV facility and is used for launches towards higher-inclination orbits. In preparation for launch, the Dragon spacecraft was powered up twenty eight hours before the scheduled liftoff. Powerup of the Falcon 9 occurred at the ten hour mark in the countdown. Fuelling operations on the rocket began three hours before launch when RP-1 propellant was loaded into the vehicle, with liquid oxygen loading beginning around twenty five minutes later. Fuelling was completed by around the ninety minute mark in the count, although the oxidiser tanks continued to be topped up until shortly before liftoff as the liquid oxygen boils off. The terminal phase of the countdown began at the ten minute mark, while operations to retract the Strongback structure that is used to erect the rocket on its pad and houses the umbilicals which support it throughout the countdown, began around the four minute and forty second mark. 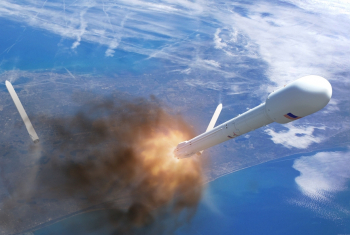 The Flight Termination System (FTS), which will be used to destroy the rocket in the event of an anomaly, was switched to internal power about three and a quarter minutes before launch and armed at the three minute mark. The Launch Director was to give his final go for launch two and a half minutes before the end of the countdown, with the Range Control Officer confirming that the range is clear to support launch with two minutes left until liftoff. However, during Monday’s attempt, this call was slightly delayed, ahead of a scrub being called. The issue was noted as actuator drift – possibly due to air in the system – on the Upper Stage TVC system, which required resolution – in the form of a replacement – ahead of the next launch attempt, set to take place on Saturday. All went to plan during Saturday’s attempt, however, as the first stage’s nine Merlin-1D engines ignited three seconds before launch, with liftoff occurring once the countdown reached zero. The Falcon began its ascent to orbit, manoeuvring to the necessary trajectory for Dragon to rendezvous with the International Space Station. About seventy seconds after liftoff the rocket reached the speed of sound, and shortly afterwards it passed through the area of maximum dynamic pressure. The first stage burned for 157 seconds, with main engine cutoff followed four seconds later by stage separation. The second stage, powered by a single Merlin engine optimised for operation in a vacuum, ignited eight seconds after staging for its first and only burn of the mission. Around forty seconds into second stage flight the protective nosecone of the Dragon spacecraft was jettisoned. The second stage burned for six minutes and thirty eight seconds to inject Dragon into low Earth orbit. Following the end of its burn the vehicle coasted for thirty five seconds before spacecraft separation at ten minutes and two seconds mission elapsed time. Around a minute after separation the Dragon deployed its solar arrays. Its instrument bay door, used by its guidance, navigation and control (GNC) system were opened at around the two hour, 20 minute mark in the mission, after which the spacecraft will begin a series of burns to raise its orbit for rendezvous with the International Space Station. Arrival will see the spacecraft positioning itself ten metres away from the space station for capture by the CanadArm2 remote manipulator system. The Dragon will be berthed at the nadir of the Harmony module for around a month, after which it will be unberthed using CanadArm2 and the spacecraft will be deorbited. The trunk section will burn up in the atmosphere upon reentry, while the capsule will land in the Pacific Ocean under parachute. Ahead of its departure the spacecraft will be loaded with 1,662 kilograms (3,664 lb) of cargo to be returned to Earth. While the Falcon 9’s second stage continued to orbit with the Dragon spacecraft, its first stage executed a series of manoeuvres which SpaceX hoped would culminate in a successful landing atop a floating platform off the coast of Florida. The demonstration followed successful tests during two previous launches where the first stage has been guided to a controlled water landing, however the stage has not been recoverable on either previous attempt. In order to facilitate landing the first stage was outfitted with deployable legs, previously flown on the CRS-3 and Orbcomm missions last year. Achieving a precision landing on a floating platform is an important milestone for SpaceX as they attempt to demonstrate their planned flyback recovery of the first stage of the Falcon 9. 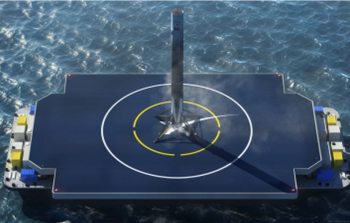 The company eventually hopes to make the first stage reusable, flying back to an onshore landing pad at Cape Canaveral. However, the stage did not survive its landing, despite achieving its target. Mr. Musk confirmed the stage did reach the platform, but did hit it “hard” – likely resulting in the stage exploding. The launch was the first of 2015 worldwide. Following on from a year in which SpaceX conducted six successful launches, the Dragon mission heads up a 2015 manifest which could consist of over fifteen flights for the Falcon 9. While parts of the schedule are far from set in stone and it is extremely unlikely that all of these missions will fly this year, SpaceX have every chance of improving on last year’s total – the most launches they have conducted in a single year to date – and could reach double figures. The next Falcon launch will be attempted at the end of January, orbiting the Deep Space Climate Observatory for America’s National Oceanic and Atmospheric Administration (NOAA). This will be followed in February with the deployment of a pair of communications satellites – Eutelsat 115 West B and ABS-3A, in a single launch from Cape Canaveral. SpaceX’s first launch of the year from Vandenberg is currently scheduled for late March, carrying the Jason-3 satellite for the NOAA and EUMETSAT. The next Dragon launch is scheduled for early April, with further missions planned for June, September and December. The September launch will also deliver to the ISS the Bigelow Expandable Activity Module (BEAM), a prototype inflatable space station module. 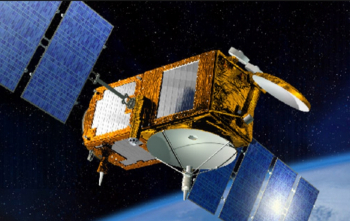 Other launches slated for 2015 include a single launch with another eleven satellites for Orbcomm, Israel’s Amos 6 communications satellite, a SAOCOM Earth observation satellite for Argentina. Launches of communications satellites for Turkmenistan, SES of Luxembourg, JSAT of Japan, a further dual launch of Eutelsat and ABS spacecraft and two clusters of Iridium spacecraft are also reported to be pencilled in during the year. A test launch of the Falcon Heavy rocket could also potentially occur towards the end of 2015. A launch in April carried the CRS-3 Dragon mission, with a flight in July orbiting six Orbcomm communications satellites. Back to back flights in August and September carried a pair of communications satellites for AsiaSat, before what turned out to be Falcon’s final mission of 2014 occurred in September, with CRS-4. The launch had previously been scheduled for mid-December, however a delay was announced following a static fire attempt on 16 December which uncovered valve problems on both stages of the rocket. The test was successfully reattempted three days later, however the second stage issue, combined with the Christmas period, led to the launch date slipping into January.